Brother Jesús Alberto Rodríguez Delgado began his position on Sept. 1 as personal secretary of the superior general, Brother Ernesto Sánchez, for a three-year period. He replaced Brother Pau Fornells, who held the post from Sept. 1, 2015, until Aug. 31, 2018, under the mandate of the former superior general, Brother Emili Turú. “I think the most valuable thing is to live in an international community and that in my work I get to know more deeply all that is lived in the Institute and, above all, what has to do with the life of the brothers and the government of the Institute”, affirmed Br. Pau on Aug. 27. 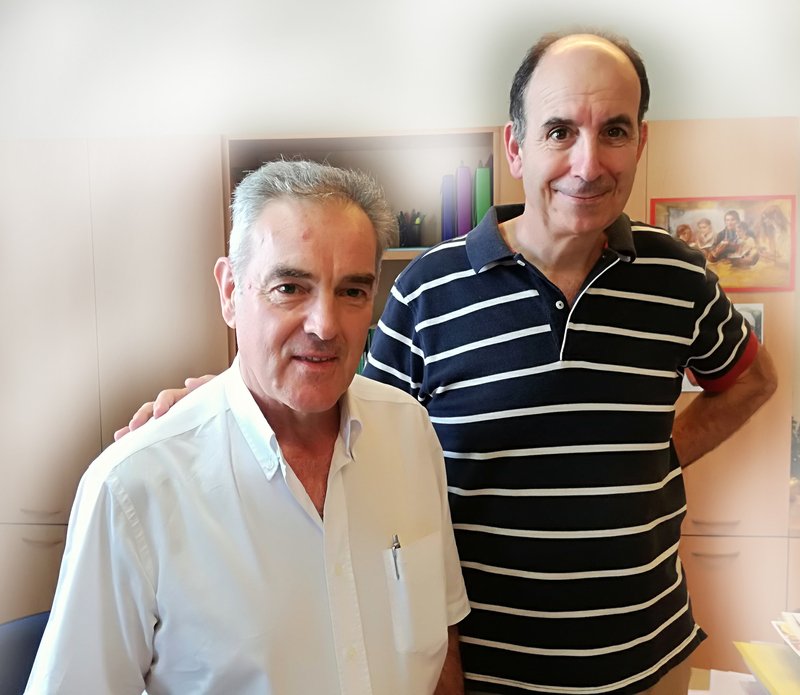 Brothers Pau and Jesús strengthened their friendship when Br Pau worked as director of the Secretariat of the Laity, from 2006 to 2010. At that time, Brother Jesús worked a lot for the Marist laity and resided in a mixed community of brothers and laity in Salamanca. Here is a biography of Brother Jesus, who tells firsthand about his life. Our life is very similar to the course of a river, the course of a day, the rotation of the earth. From the beginning to its end, we change, we feel, we learn, we lose, we mature, ... My case is like that of so many others. I was born, like many Marist Brothers, in Burgos, Spain, a land that is fertile in vocations. I walked my first steps between the alleys near the great Gothic cathedral. I would walk passed it many days to go to the school of the Centro Educativo “Colegio Círculo” run by the Brothers. I first heard about Marcellin Champagnat in class and it was there that I fell in love with his lifestyle and his apostolic work. Then came the years of formation in the various juniorates of Venta de Baños, Miraflores, Arevalo and Tui to do postulancy, novitiate and scholasticate in another great, beautiful and educated city, full of history: Salamanca. The harvest is plentiful, but the workers are few. It was time to start working, put the apron on, get one’s hands dirty, face reality and carry out an apostolic work for which he had dreamed.Many years of my life have been full of children, students, brothers and communities. Teaching, educating, playing, living and enjoying life have been the main characteristics of many years of happiness and joy. Thus I have been happy with many Marist Brothers with whom I have lived and shared so many unforgettable events. Pastoral activities and the mission in general have taken me to different places, such as to classrooms with older and younger children, and to houses of formation in all their variety. I have spent many years looking after and forming juniors, postulants and novices. In recent years I have discovered the richness of working and living with the laity. I have shared my Marist life, its values and challenges with a big group of people who want to live the spirit of Marcellin. The richest and most endearing experience was sharing community life with them. I have been and continue to be an active and restless person. I have also felt personally the repeated invitations made to us to “go out”, “widen the tent” and “go in haste”. Back in the day when I was younger, I spent a few years in Zambia, living another wonderful experience of community and poverty. Fighting, sometimes for survival, but always very aware that progress and development begins with the education of children and young people. I still use summertime to go to the work camps or to give a Marist hand wherever it is needed. Although I am getting older - the river of life runs its course until reaching the sea, which is death, - this river takes an unexpected turn and, suddenly, they asked me for a different service: to be the personal secretary of the Brother Superior General. Put that way, it scares me but when I look at it up closely, it thrills me. It came to my mind that verse “And how does this happen to me, that the mother of my Lord should come to me?” and shortly after that of “May it be done to me according to your word.” It is a challenge, and more than anything, a unique opportunity to live like a good Marist brother at the service of others, doing good with humility and simplicity. The three violets have life and flourish in each one of us.